Organized by types of materials and applications, this guide helps designers successfully address material evaluation and selection of interior components. 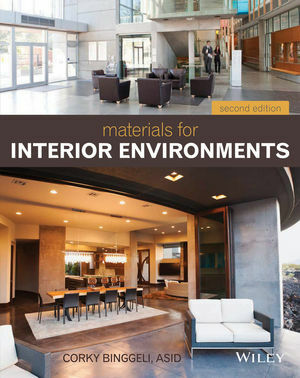 Engagingly written, highly detailed, and helpfully illustrated with more than 550 color illustrations, Materials for Interior Environments is a comprehensive guide to everything a designer needs to know about the materials available for interiors—from aesthetic qualities to manufacturing and fabrication, applications, installation and maintenance, and specifications for materials used in commercial and residential applications. Corky Binggeli, ASID, practices at Corky Binggeli Interior Design and is a member of the faculty at Boston Architectural College. A professional member of ASID and past president of ASID New England, she is the author of Graphic Standards Field Guide to Commercial Interiors and Building Systems for Interior Designers. She is the coauthor with Francis D.K. Ching of Interior Design Illustrated and the editor of Interior Graphic Standards, Second Edition, all from Wiley.